This recipe was published in Discover Chennai Magazine. 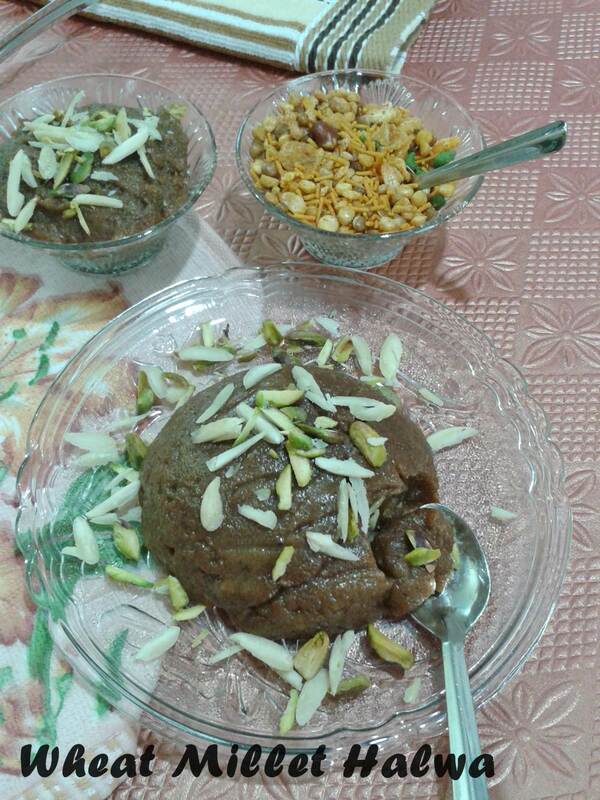 In this halwa I have added millet flour along with regular whole wheat flour to make more nutritious. Millet flour has lots of nutrients in them. 1. In a bowl mix wheat flour, millet flour / millet puttu flour, water, milk and salt and let it soak for 1/2 hr. 2. Remove seeds from the dates and soak them in hot water for 10 minutes and cool them and grind them to a smooth paste. 3. In a pan melt jaggery with little water and bring to a boil. Filter and keep aside. 4. To the soaked millet mixture add dates paste, jaggery syrup and milk powder. 5. Transfer the wheat millet mixture into a non stick pan and over medium flame keep stirring continuously till it thickens. When the mixture starts to leave the sides of the pan , add cardamom and ghee ,mixture takes about 20 minutes to reach this stage. 6. Stir for another 3-4 minutes. Looks absolutely yummy. Will surely make this at home. Healthy combo , will try soon.